The pinball is based on Steve Ritchie's hit design and is the latest addition to the hugely successful AC/DC pinball lineup. 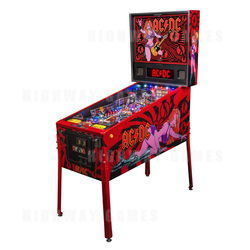 It features an entirely new original artwork package that captures the titillating rock and roll spirit of AC/DC and pinball. Players will rock out with Luci to twelve classic AC/DC hits including "Back in Black," "Highway to Hell" and "You Shook Me All Night Long." Other exciting game features include a lower playfield, ball-shooting cannon, drop targets, a mechanized Hell's Bell and animations of the band. This decidedly edgy tribute to one of rock and roll's most memorable bands pushes the visual and auditory limits with its style, sound and infectious riffs. New "Underworld" Lower Mini Playfield with 2x Flippers and Targets. Hand-drawn, Retro Rock 'n' Roll, Pin-up Cabinet Art. Molded 3D "Rock 'n' Roll Train with LED Headlight and Horns. Hells Bell Swinging Newton Ball Pendulum with Score Sensor. Hidden Magnet Pendulum Attractor to Start Bell Swinging Remotely. 5x Bank AC/DC Drop Targets (on left). 3x Bank T.N.T. Drop Targets (in center). SLAM Action Target behind Center T.N.T. Drop Target. Crossover Ball Track with Diverter from Left Ramp to Right Ramp. T.N.T. Detonator Animated with Solenoid Actuated Handle. "Highway to Hell" Animated LED Flames Tunnel. "Back in Black" Super Bright LED Strobe Lights. LED Control Lamps including 16 Tri-Colour LEDs Under Key Inserts. 12 Inch Subwoofer for Enhanced Sound Performance. Classic Lock Down Assembly and Playfield Slide Support. Red Gloss Powder Coated Legs, Hinges, Front Molding, and Side Armor with Flipper Button Protection.